This time spacefans we’re mixing it up a little as I’m snowed in and because I damn well feel like it! As many of you know, I’m an astrobiologist and hunting aliens is what I do, but I’ve never really gone into it much. How likely is it we will find them I hear you ask? Well to do that, let’s have a little look at the Drake equation I’m sure most of you will have heard of. We need to break this down and explain all the components. R*= Rate of formation of solar-type stars in the Galaxy (R*≈ 1 per year). The rate of star formation in the Milky Way is not currently well understood and can vary between 1-10M® (Stellar masses=mass of our Sun)per annum, although studies have suggested a rate of 0.68-1.45M® . This is of course stars of any sort, not just stars like our Sun, it’s perfectly feasible for stars of stellar types F, K and M as well our own G-type star to harbour life, depending on planetary distances from the star. Stars do however need to be sufficiently long lived, so they need to be no larger than around 1.1M® to give life enough time to get going, our Sun is a middle aged main sequence star and it’s taken 4.5Gya to produce us as the larger the star, the shorter its lifetime. We also have to take into account that the star formation rate would have been higher when the galaxy was young. Star rate formation (SFR) was higher 10 billion years ago, when the Sun was born, so on that basis, 7M® seems about right for stars we can detect now, so for a Sun-like star, which does imply that the number is probably close to Frank Drake’s 1 Sun-like star per year. I feel looking at current star formation, without taking past star formation into account is unwise. The Kepler data indicates that almost all stars have at least one planet, we can probably feel reasonably confident if we use a conservative 90%, which is higher than Drake’s original estimate of 20-50% as we hadn’t discovered exoplanets back in 1961, the actual figure is nearer 100% but let’s be sensible.. This is where things get interesting. If we stick purely to planets, as opposed to anywhere else that could be suitable as per Frank Drake’s original equation (Drake optimistically estimated 2 habitable planets per solar system), these have to be within the ‘Goldilocks Zone’ with liquid water. As we know from our own solar system, we have 3 planets in that zone with only our own planet definitively having free-flowing liquid water and life. The surface of Venus is incompatible with life as we know it being far too hot, toxic and with insanely high atmospheric pressure at the surface, and Mars is at best marginal due to its thin atmosphere, its low temperatures and lack of free flowing water, although we know that it may well have been habitable in the past. Many other factors can influence habitability such as having an excitable M class star which can produce huge solar flares that can fry life, or a planet being tidally locked to its star. Galactic location is also important as if a planet forms too close to the centre, ionizing radiation is a danger, so not having too many neighbours or being too close to the galactic centre is an advantage. While not completely ruling out habitability, it will certainly influence the number of available planets that can support life. So let’s use a conservative 0.5, or 1 habitable planet for every 2 solar systems. Drake originally thought between 1-5 habitable planets. However, as we are now aware, the actual habitable zone is much wider than originally thought due to the possibility of life emerging on moons such as Europa and Enceladus which are outside what was originally perceived as the habitable zone. We’ve as yet to discover exomoons, let alone discover what they’re like, for all we know there could be many moons like the movie Avatar’s Pandora, but we simply cannot quantify that at the moment. Our Solar system is also unusual in that the most common planetary type are ‘Super-Earths’ and ‘Sub-neptunes’. We don’t have either, which is odd, nor do we have a hot Jupiter. Our only current explanation is that way back in its youth, things went a little crazy. Jupiter migrated towards the Sun causing havoc leading to Mars being smaller than it should and flinging stuff into the Sun or out of the Solar system altogether, hence the search for the controversial ‘Planet 9’. We are however lucky in having a gas giant such as Jupiter to hoover up debris that could hit our planet. Fl = Fraction of such planets on which life actually develops. This number is a wild guesstimate as we only have one example which is our own planet. However, we know that Earth had liquid oceans ~100 million years after its formation and that life began as soon as it had the opportunity, possibly even before the Late Heavy Bombardment, but certainly very soon afterwards at 3.5-3.8 Gya. What we don’t know is how life began on Earth, or even if it began here. It could have originated elsewhere in the solar system or have been seeded from elsewhere in the galaxy via panspermia. This life does not need to be cheese and wine loving astronomy professors; microbes are perfectly acceptable to the aspiring alien hunter and also more likely. Drake has this number as 1, or 100%, however as we know from exoplanetary data, that merely because a planet is in the Goldilocks zone, many aforementioned factors can come into play. The ‘rare Earth hypothesis’ requires a very particular set of initial conditions in order for life to emerge, such as having a stabilising moon, stable orbit, plate tectonics, and a magnetic field. 50% seems a sensible figure here as we’ve seen via Kepler data, that there are many reasons why a planet located at the right distance from it’s star may be uninhabitable. Fi = Fraction of such life that evolves ‘intelligence’. Life may start quickly, 3.8-3.5Gya, but complex life takes longer, multicellular life arose about 1Gya, although complex cells with organelles such as chloroplasts and mitochondria evolved a lot sooner. Another thing I feel we should consider; how do we know that humans are the only intelligent animals to have ever evolved on Earth? Earth has had regular extinction events, if a meteor had wiped out the East African cradle of humanity, no one would ever have known we had ever existed, so who’s to say that intelligent tool wielding fire making reptiles didn’t evolve in Mexico 65Mya leaving no trace of a proto civilisation. Frank Drake had this figure at 1, I feel that is overly optimistic 0.05 seems more likely. Fc = Fraction of such intelligent life that becomes ‘communicative’ (i.e. builds radio telescopes). Our species has been leaking radio spectrum broadcasts for about a century and covers about 200 light years, which really isn’t very far as you can see. Did I mention space is big? 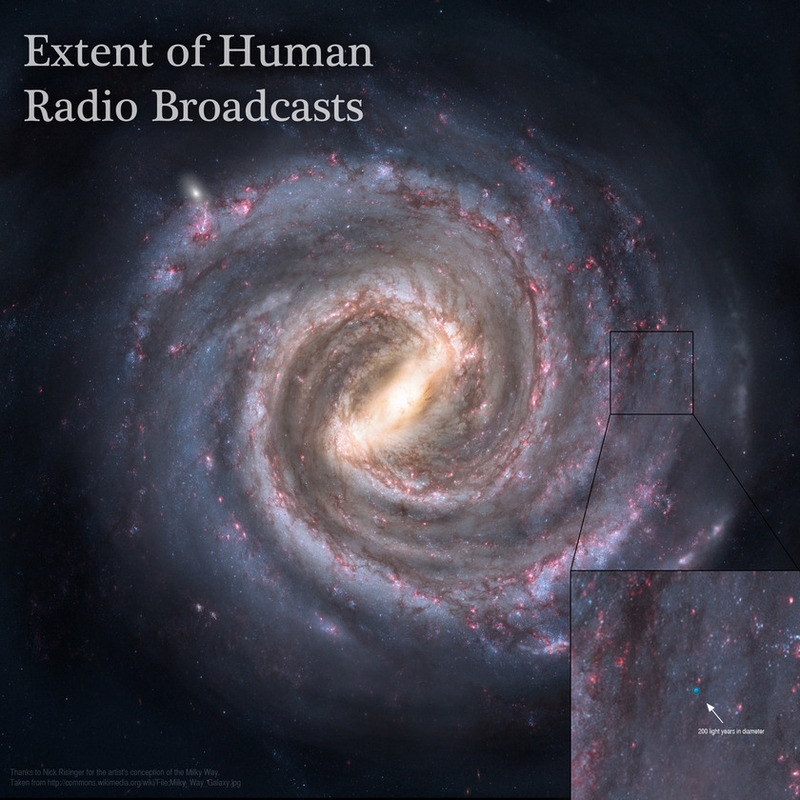 As an illustration of how far we’ve broadcast to put things into perspective: pay attention to the pale blue dot, that’s 200 light years across. These broadcasts are passive and go in all directions, and will degrade with distance which if one thinks about modern human history, may in fact be a good thing. Other civilizations may use another method of communication, one we’ve yet to discover, or may even deliberately mask their presence. Drake had this figure at 0.1-0.2, is this reasonable? It’s as good a number as any to be honest. We have indeed been trying to deliberately broadcast and listen, but where do we look? L = Life time of a communicative civilisation. I feel that this is better phrased as ‘How long a civilisation remains detectable’. Many, many factors come into this, including, methods of communication, did they survive the hazards of becoming a technological civilisation, such as the ones we face with war, climate change, overpopulation, resource consumption, aside from natural disasters like asteroids, disease or supernovas. Effectively we’re in a type of evolutionary bottleneck, that if we survive, we could survive indefinitely via genetic manipulation, artificial intelligence and seeding ourselves through space. Drake had this number at around 10,000 years back in 1961. This doesn’t seem too unreasonable as even if/when we discover more efficient means of communication, you don’t just forget a handy spectrum. If we plug in these numbers we get N=1×0.9×0.5×0.05×0.05×0.2×10,000 = 2.25 civilisations over a 10,000 year period. Drake concluded that there were between 1000 and 1,000,000 civilisations in our galaxy. If you consider just how big the galaxy is, these numbers don’t stretch the imagination too much, however nor does my figure of 2.25, which includes us. As we simply don’t know, it’s pure conjecture. The main issue is of course, if they’re out there, where are they? This is the main thrust of the Fermi paradox, would we ever find just one other civilisation in our galaxy? These numbers are for the most part arbitary as we ourselves are the only example we know. Are we lucky? Undoubtedly, but are we rare? In our galaxy, perhaps as I type, there maybe be just us, a civilisation may have become undetectable yesterday, lask week or a century ago. We could have evolved too early and the remnants of our existance left out there for future civilisations to find and puzzle over. There may well be life teeming throughout the galaxy, but it may not be intelligent or sophisticated enough to play internet spaceships. The origins of life on Earth is deeply related to all these questions. I’m more than happy to tackle them if you so wish! We may well be the only intelligent life currently in our galaxy, which is sad, but in the words of Douglas Adams “Space is big. You just won’t believe how vastly, hugely, mind-bogglingly big it is. I mean, you may think it’s a long way down the road to the chemist’s, but that’s just peanuts to space”. Nice write up if a bit on the technical side. A couple of things. Kinda surprised you didn’t bring up anything about the Neptune size planet in the Kuiper belt a couple of respected astronomers say there is evidence for. Also you mentioned how a older alien civilization may have a better means of communication capabilities. Perhaps Quantum Entanglement may be the answer. If the range of our detectability is 200 light years, should we also include another factor which reduces the number of communicative civilizations in Milky Way which we can detect, proportionally?